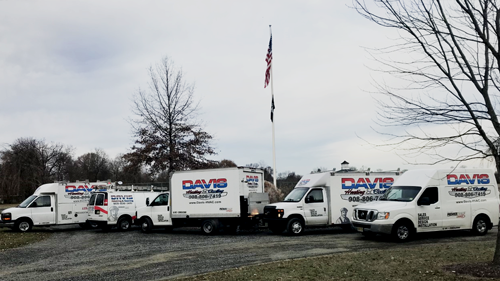 Davis Heating & Cooling is a family-owned and operated business proudly serving central New Jersey homeowners and based in Flemington, New Jersey. We have built a great reputation by providing quality products and service at affordable prices. We have established our business by maintaining high standards and providing superior service & commitment to our clients. With over 30 years of experience in the Heating Ventilation and Air Conditioning field, we have the knowledge and experience to deliver the most sound recommendations and service quality. If you are in need of a new heating or cooling system or need to upgrade an existing system, you can rest assured that with Davis Heating & Cooling you will always receive the most advanced and energy efficient systems at the best possible price. We always keep a safe and clean job site using drop cloths and removing trash regularly to protect your floors and preserve your home environment. Every new installation is completed with a complete system start up and guidance on operation for our valued clients. If you need a repair, we service all brands including Lennox, American Standard, Bryant, Carrier, Coleman, Gibson, Goodman, Rheem, Ruud, Westinghouse, York, and many more. It is our promise to arrive on-time and well equipped to handle your service request with the honesty and integrity that our clients have come to expect. To make your experience with us even better we will send you a prompt notification that a Service specialist has been dispatched. This includes a picture of Service Specialist sent in either email or text message for your convenience so that you recognize him when he arrives. We are also proud to offer flexible financing options from Service Finance & AMS Financial to make unexpected repairs and replacements easier on your wallet. It will be our pleasure to hear from you for your heating and cooling need. Let us show you the Davis Difference!